Considering it was named Sportsradio 1310 The Ticket's official beer of North Texas Beer Week in 2014, it's no surprise to learn that Franconia Brewing Co. of McKinney is bringing back Bordeaux Tripel Dunkel in time for this year's round of festivities. What may be a surprise, however, are plans the brewery has for two additional beers it's brewing especially for the occasion. The first is Pineapple Kölsch, a beer which takes the recipe for Franconia's year-round kölsch and adds an experimental hop known as Nuggetzilla. According to founder Dennis Wehrmann, the brewery whipped up a test batch a few weeks back and tapped it by surprise during a Saturday tour. "We only had enough to fill a single keg," says Wehrmann, "but everyone loved it and it didn't last the day." Judging by a separate test batch I sampled based on Franconia Amber, Nuggetzilla should add a distinctive pineapple tone to the beer, along with a strong resiny element and some bitterness. These latter characteristics are the result of the hop's high oil and alpha acid content (15-17%). Nuggets of Nuggetzilla (Brian Brown / Beer in Big D). Regarding the other new beer, an eisbier to be called IPA Ice Bock is in the works as well. Wehrmann says he and head brewer Cam Horn haven't made this particular beer before, but it will be done in a similar manner to previous versions created using Winter Wheat and Tripel Dunkel. Like those beers, after Franconia Double IPA spends time in the deep freeze, the ice crystals will be removed leaving a beer more concentrated in both flavor and aroma. Less water means the finished beer will have more alcohol as well, likely at or above 10% based on the value of the brewery's standard DIPA. Both beers will be tapped, along with Bordeaux Tripel Dunkel, during the annual Open Haus Franconia hosts as a part of North Texas Beer Week. Happening Thursday, November 12 from 6-9 p.m., the event will feature food trucks, a live bottling line run and an appearance by Donnie Nelson, the general manager and president of basketball operations for the Dallas Mavericks. Dallas Untapped Festival at Dallas Fair Park, 2:30 p.m. (click here for tickets). Kelly's at the Village in Allen, 6 p.m. Cold Beer Company in Dallas, 6 p.m.
Ginger Man Lakewood/Plano/Southlake, 6 p.m.
Fillmore Pub in Plano, 6 p.m.
Ginger Man Dallas/Fort Worth, 6 p.m. Brewer's Ball in the Dallas Renaissance Hotel, 7 p.m. (click here for tickets). Franconia is the second-to-last stop of the 2015 Brew HaHa Comedy Series. The event occurs on Friday, November 6 at 7 p.m. (click here for tickets). 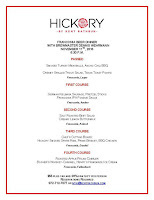 The brewery has partnered with Kent Rathbun for a beer dinner at Hickory in Plano on Wednesday, November 11 at 6:30 p.m. See the image to the right for a rundown of the menu and call 972-712-0777 to make reservations. 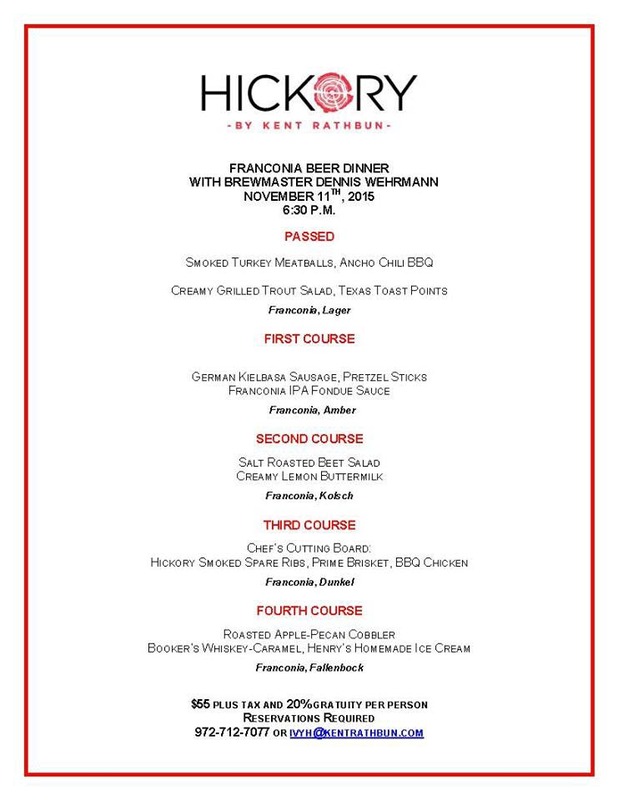 Note that beer pairings (not listed) will feature Franconia's regular lineup: Amber, Dunkel, Kölsch, Lager and Fallin' Bock.